• For quantitative determination of free and total sialic acid (NANA) and evaluation of drug effects on sialic acid. • SIALIC ACID is a general name for nine carbon acidic sugars with N- or O-substituted derivatives. The most common member of these sugars is N-acetylneuraminic acid (NANA). Sialic acid is widely distributed throughout mammalian tissues and fluids including serum. Sialylated oligosaccharides have been shown to exhibit antiviral properties and are also known to influence blood coagulation and cholesterol levels. The sialic acid level in body fluids is also an important marker for diagnosing cancer. Simple and direct procedures for measuring sialic acid concentrations find wide applications in research and drug discovery. 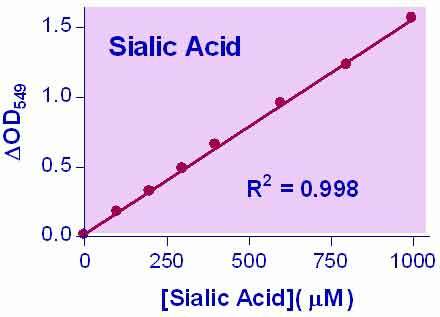 BioAssay Systems sialic acid assay uses an improved Warren method, in which sialic acid is oxidized to formylpyruvic acid which reacts with thiobarbituric acid to form a pink colored product. The color intensity at 549 nm or fluorescence intensity at λex/em = 555/585 nm is directly proportional to sialic acid concentration in the sample. 1. What is the difference between your two sialic acid assay kits? The DSLA-100 assay kit is based on the oxidation of sialic acid with periodate and detection of the reaction product formyl pyruvic acid with thiobarbituric acid.The ESLA-100 assay kit is based on enzymatic digestion of sialic acid with NANA-aldolase (N-acetyl-neuraminic acid aldolase) and detection of the breakdown product pyruvate.